When: According to many scholars, they crossed the Bering Strait about 12,000 years ago (though scattered signs of human life predate that). Where: By 9000 years ago, distinct groups were spread from Alaska to Tierra del Fuego. Examples of those before or at the time of Columbus: the Carib (Caribbean islands and Central America), the Nasca and Moche (Peru), the Araucanians (Chile), Guarani (Brazil and Paraguay), and the Toltecs (Mesoamerica). When: Dominant for hundreds of years; golden era ended around A.D. 900. Culture: Agricultural experts; life centered on corn as both staff of life and god. Skilled in astronomy, the arts, warfare, and math (they used the concept of zero 1,000 years before Europe). Complex writing system. Religion: Highly important; rituals involved blood sacrifice. Encounter: Already weakened, could not significantly oppose Spanish. When: Zenith by the 1300s. Culture: Capital, Tenochtitlán (Mexico City), much larger than London in 1519. Violent and highly organized. The “Romans” of the New World. Religion: Highest offering to gods (corn god was central) was human heart. Motecuhzoma II’s (Montezuma II’s) crowning in 1502 required sacrifice of 5,000 people; dedication of great temple 20,000 people. Encounter: Spaniards’ smallpox and numerous wars with Cortés and native allies decimated them. Where: Empire stretched 2,500 miles from Ecuador to Chile, larger than Roman Empire. 12 million people. Capital in Cuzco— “the center of the universe”—with secondary capital in Quito. When: 1400s and early 1500s. Culture: 18,000 miles of paved roads. City of Machu Picchu boasted 100 acres of temples, plazas, barracks, and houses. All land held by emperor in trust for people. Communication inquipu, complex bundles of colored and knotted string. Religion: Sun god above all. Encounter: Their gold and silver seduced Pizarro, who, aided by smallpox and civil wars, conquered the empire. •Spanish culture: Charles I, king of Spain, prohibited non-Spanish clergy from going to the Americas. So Latin America became marked by the unique qualities of Spanish Catholicism. •Depopulation: Spanish expansion into the Americas caused rapid depopulation. Some scholars estimate that when Columbus arrived, there were 44,000,000 native Americans. Just 150 years later, there were only 5,600,000. What caused the dramatic drop? European diseases (such as smallpox), wars and slaughters, and forced labor or slavery. Many Christians did, however, speak out against the atrocities and try to alleviate the natives’ sufferings. •Schools and hospitals: By 1820, there were 25 universities and 56 secondary schools, most started and run by monastic orders, as well as numerous hospitals. •Church and state: Church and state were united and controlled all facets of life. By 1805 Alexander von Humboldt estimated that in some provinces of Mexico the church directly or indirectly controlled 80 percent of the land. •Hierarchical society: Society was stratified with the Spanish-born Peninsulares at the top; their American-born children (Creoles) next, the “mixed-blood” mestizos next; the Indians and black slaves at the bottom. Church leadership drew mainly from the top tiers. •Church orientation: 500 years after the first Christian contact, the region is a strong Catholic center, with increasing numbers of Protestants. •Who: Bernal Buyl, vicar apostolate and representative of Ferdinand and Isabella, and 12 other churchmen. •When: Columbus’s second voyage. 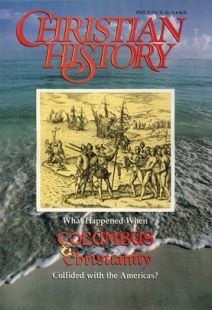 Columbus was directed in May 1493 to convert the natives to Christianity and to establish a colony. The missionaries sailed with him that September, bringing equipment for a church (a gift from Queen Isabella). •Where: La Isabela, a settlement founded on the Caribbean island of Hispaniola (located between Cuba and Puerto Rico). On January 6, 1494, first worship service held there. •Development: Within a generation, members of the major orders (Franciscans, Dominicans, Augustinians, Mercedarians, etc.) spread throughout the Americas. •Schools established: Many schools educate Indians, though some refuse Indians and children of mixed ancestry. When: Columbus’s second voyage, in 1493. In 1524, the “12 Apostles of New Spain” arrive in Mexico. By 1559 the Franciscans have 80 houses and 230 religious workers. Where: Largest share of conversions in Mexico, Ecuador, Bolivia, Florida, and New Mexico. When: Come to Santo Domingo in 1510. Fifty years later, there are 210 Dominicans in 40 houses. Where: Strongest in Peru, Colombia, and the Caribbean. Emphases: Founding universities, such as the University of Lima in 1522. When: Order founded in 1540. Members arrive in Brazil in 1549 and in Peru in 1567. Two hundred years later, all 2,200 Jesuits are expelled from Spanish America. Some return to Brazil in early 1800s. Emphases: Establishing Indian communities known as reducciones. Starting schools. Teaching Creoles, children of the Spanish-born colonists. William D. Taylor is executive secretary of the missions commission, World Evangelical Fellowship.